Are you a coffee lover? Your morning isn't right without a good cup? 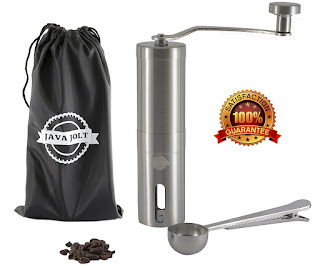 It's hard to find just the right grind in the stores and this Manual Coffee Grinder by Java Jolt makes it possible to customize your coffee to the perfect grind. It doesn't use batteries or electricity, it's a manual crank. You can silently grind your coffee and not disturb anyone while you do it, even early in the morning or in a quiet office setting. Not needing a power source makes it perfect to take along camping, hiking, traveling or even to work with you.It comes with a travel bag making it easy to take wherever you go. This manual grinder is made from top quality materials, it has a premium stainless steel body with a zinc crank shaft handle. The grinder is a conical ceramic burr,and it is adjustable. What does this mean to you? It means that it will not rust or wear down. There will never be particle residue and will work perfectly for years to come. Java Jolt Manual Coffee Grinder is not only convenient to carry, built to last but seriously will save you money. Have you been in a specialty coffee shop lately? Not dropping any particular names but I'm sure you know what I'm talking about. The prices are crazy!! Now you can enjoy the coffee or tea you love, custom ground the way you like it, at a fraction of the cost. You need not stop at just using this for coffee, you can also use it to grind herbs, tea, even smoking tobacco, or medicinal herbs. This manual grinder is very versatile, and can be adjusted to tailor your coffee grind to your taste.